Horn Model 63 Embroidery Storage Chest Available in Sunset and Sunrise Maple $1,659.00 - FREE SHIPPING! The Horn Model 63 Embroidery Storage Chest - One Convenient Storage Chest for All Your Embroidery Components and Supplies! 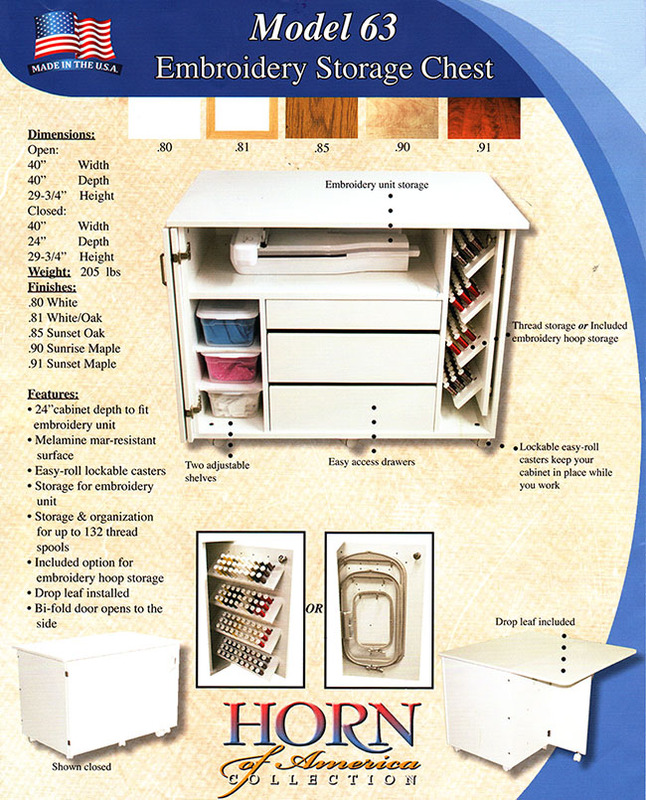 The Horn of America Model 63 Embroidery Storage Chest is the perfect piece for your sewing/embroidery room! There is plenty of storage for your embroidery unit as well as storage and organization for up to 132 thread spools. It comes equipped with a drop leaf installed for your convenience and a bi-fold door that opens to the side. Add the Horn of America Model 63 Storage Chest to your collection today! Designed specifically for embroidery components and supplies, the Horn Model 63 Embroidery Storage Chest is a piece of sewing furniture that no embroiderer’s workspace should ever be without. This storage cabinet has so many features, you’ll wonder how you ever got along without it! The conveniently-sized Horn 63 storage chest is 40” wide and 24” deep when closed or 40” deep with the rear drop leaf lifted up to increase the top so it can be used as a workspace. The cabinet is 29 ¾” high, the perfect height to match other Horn sewing components to create one conjoined unit and has caster-supported bifold doors that open out of the way and to the side of the cabinet. Inside the cabinet, there is a trove of organizational elements that make efficient use of the interior space plus there are three easy access drawers in the center, a tall storage cubby on the left, and a pull-out panel on the right. There are two adjustable shelves in the left cubby and the pull-out panel comes with a thread organizer that holds up to 132 spools installed. The thread organizer can be exchanged for an embroidery hoop hanger included with the chest and the shelf above the drawers and cubby is large enough to store an embroidery unit. The Model 63 chest is covered with a durable, mar-resistant melamine surface that can be ordered in 5 different finishes: white, white with oak trim, sunset oak, sunrise maple, and sunset maple. It also has sturdy, Easy-Roll casters that lock for stability and weighs 205 lbs. Constructed in the USA at Horn’s own production facility, the Model 63 Embroidery Storage Chest arrives fully assembled; this cabinet is covered by Horn’s Lifetime Warranty.